Interested in working on real world research problems this summer and getting paid? We'll talk about opportunities and tips for your application! Below are some details...bring your questions! The National Science Foundation funds a large number of research opportunities for undergraduate students through its REU program. 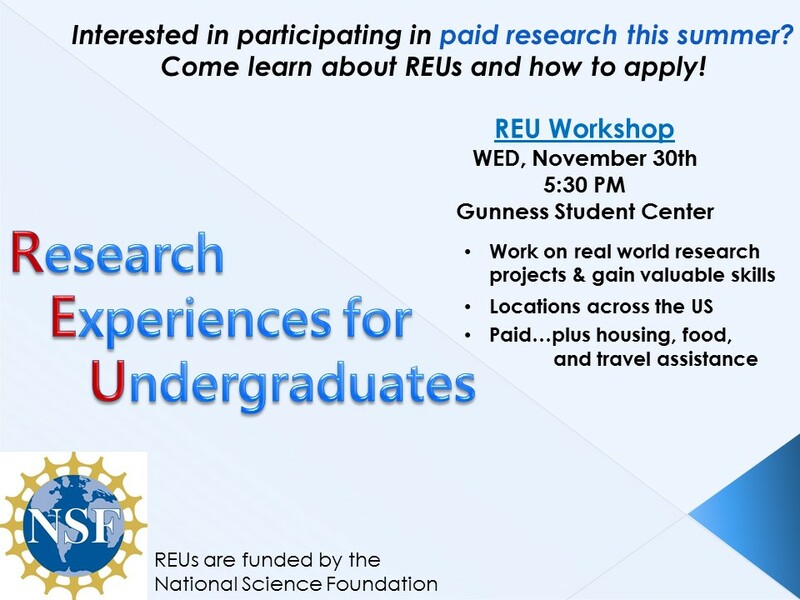 An REU Site consists of a group of undergraduates who work in a lab/program associated with a specific research project, where he/she works closely with graduate students, the faculty and other researchers. Students are granted stipends and, in many cases, assistance with housing and travel. Undergraduate students supported with NSF funds must be citizens or permanent residents of the United States or its possessions. On the REU web page (see MORE INFO below) you can search by keywords to find program sites in particular research areas or locations. Students need to visit individual sites for information and application materials.